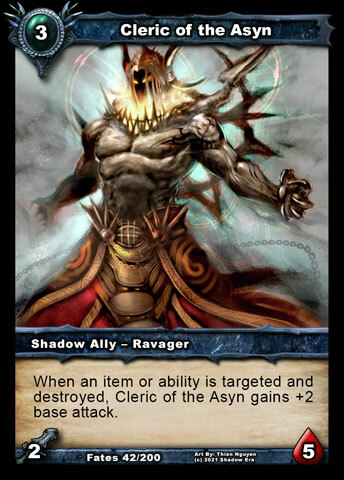 A recent Shadow Era update to Shattered Fates Expansion brings a large overhaul to the Ravager Tribe. The biggest changes for the ravagers is the transition from the +1/+1 (attack/health) stat growth pattern to a more aggressive +2/+0 flavor. The tribe still pretty much plays the same as before, however with a few games played you can really feel the difference. Being a Gravebone enthusiast, natural I decided to pair them together and see what happens. This is not a complete version but I played quite a number of games with the above and variations of the above deck to really get a feel for the pairing. I think the key card for this tribe is Thriss Alamanac. This card is an all-star, taking your less than impressive base stat allies and turning them into mean aggressive fighting warriors. This simple +2 attack transformation takes an ally with 2 attack to a 4 attack which now allows him to remove 4hp allies. Thriss Alamanac is great for boosting the entire tribe, but my favorite pairing is with Murderous Hulk. Hulk is now able to control the board fairly consistently for a very cheap cost and he has high health making him hard to remove. Almanac can be a bit tricky to play with however due to the Sustain 1cc cost. This is basically a built in self destruct button that when you no can no longer afford to pay the 1cc sustain cost deal 2 damage to opposing allies. This is not all that great as it happens at the end of the turn so opponents allies may only be injured vs dead. It also means that until you play another Almanac your tribe is playing with those weak base stats. Almanac destruction can also be triggered which generally is more beneficial since you will more than likely be gaining something from doing this. Cleric of the Asyn is another great ally for the tribe. He has staying power base stats (2/5) but once you start blowing stuff up he grows aggressive very fast. The tribe has many ways to apply this item/ability destruction growth tactic so he has very good tribal synergy. With Gravebone, You can time a revived Cleric of the Asyn with destruction very easily so it would not be uncommon for him to be put into play as a 4/5 (6/5 with Thriss Alamanac). Stoneskin is a great attachment for both Murderous Hulk and Cleric of the Asyn. Each have different ways to utilize this but both want to survive longer and Stoneskin helps tremendously. NOTE: Stoneskin removal from ally being targeted does not trigger Clerics ability. The Ravagers, can however target Stoneskin for removal so you can use it to fuel the tribe. Ravager Zealot is a great ally in his own right. He often makes appearances outside of Tribal decks because his 3 hasted damage is pretty powerful. Within the tribe he becomes much stronger and a key piece to their synergy. With Thriss Alamanac in play he can swing for 5 hasted damage. His real synergy, like Spitfire Hound, lies in the ability to use your own items, attachments and support abilities as the catalyst for the destruction the tribe uses so much. Spitfire Hound being the secondary trigger is used in less quantities. He has decent base stats and nice 2 cost summon destruction, but the 3 fire damage is often wasted. When the tribe got a makeover for +2/+0 stats the ravager allies are now equipped to handle the board often own their own without needing the 3 damage help. Thriss Demolitionist, while not at the top of the list , he can win games for you by himself. He has good staying power and a re-usable ability which feeds the tribal synergy. He can singlehandedly shutdown Warrior, Weapon, Solo(Semi) and Homunculus builds. He pairs favorably with Stoneskin for increased staying power and Cleric’s Mantle. Mantle is one of the tribe pieces that I’m still in the process of learning to use effectively. Essentially its initial intent was to pair with Cleric of the Asyn, based on the names and how they both operate. Cleric’s Mantle is the combo oriented piece, use it to target Cleric of the Asyn, then just destroying items/abilities and watch the magic happen. Cleric of the Asyn will gain 2 attack and attack opposing hero for each destruction. NOTE: Using Cleric’s Mantle on target friendly ally does not remove attachments, or negative effects from attachments such as disabled due to Captured Prey attachment (attachment is continuously applying negative effect). Obelisk of Echoes is an excellent piece for the tribe. It has a very low cost, multiple use function with high tribe synergy, and on occasion can even target itself. 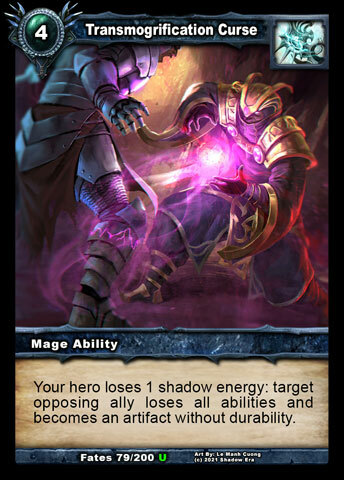 On an established board, while Almanac is in play, allies can generally hold down the fort, and Obelisk is used for support to take down opponents non-ally options to maintain full control. While Transmogrification Curse is a great control card in general, the reason we use it with Ravagers is so we can stack opponents items/abilities. This allows us to trigger Rapacious Vermin’s on summon ability easier and provides more targets for other Item Destruction techniques/combos. Rapacious Vermin is more of a tech card for Gravebone because he doesn’t have access to any healing. Incendiary Curse is a good combo card for Transmogrification Curse. Usually an opponent does not have a way to remove vanilla artifacts they control, so this becomes a great target for the damage over time effect (DoT), and when it leaves play deals an additional 3 damage to opposing hero. This essentially makes it a Fireball+ to the hero with the option to fuel the Ravager Tribe. 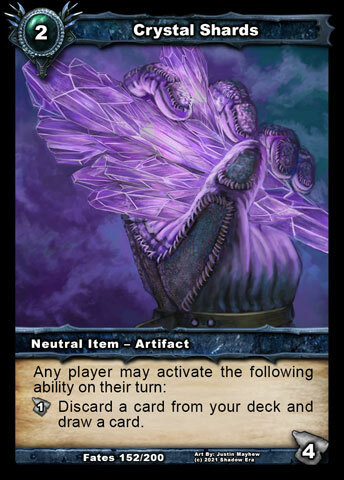 The current draw engine for GB and Ravagers is Crystal Shard. Personally I do not like this pairing, however, the operation of Crystal Shard is the reason I use it. It has a low cost (2cc) which is easy to combo, then draws by using durability. You can get anywhere from 2-4 cards depending on whether you opponent also uses it for drawing. The typical use will be for you to draw two times and your opponent draws one. After your second draw, use either Spitfire Hound or Ravager Zealot (or other means) to destroy it and prevent opponent from taking a second card. The reason I do not like the discard feature of Crystal Shard is because the Ravager Tribe is very dependent on the setup and is very combo oriented. Discarding anything other than allies (with Gravebone) can really hurt the consistency of your game plan. The secondary draw that I am using with Ravager is Sacrificial Lamb. This is another option that I would prefer not to use, as I would rather free up my allies grown/aggressive allies vs removing them. For me, there currently is not really a more favorable option, Sac Lamb can draw you a lot of cards and is a good way to remove a Rapacious Vermin due to his Sustain 1 HP cost. 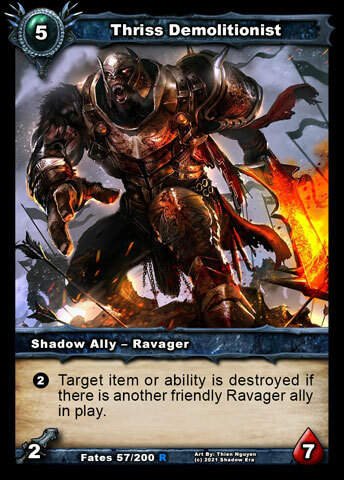 All in all, I am very impressed with the Ravager Tribe as a pairing with Gravebone. Currently I would put them a bit lower than both Undead and Homunculus Tribal builds, but mostly due to the draw engine issues. It could be that with time and more practice this view changes. 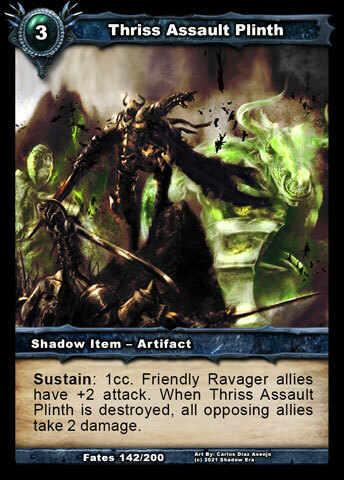 Tagged destruction, Gravebone, Ravager, Sf, Shadow era, shattered fates, Thriss, tribe.